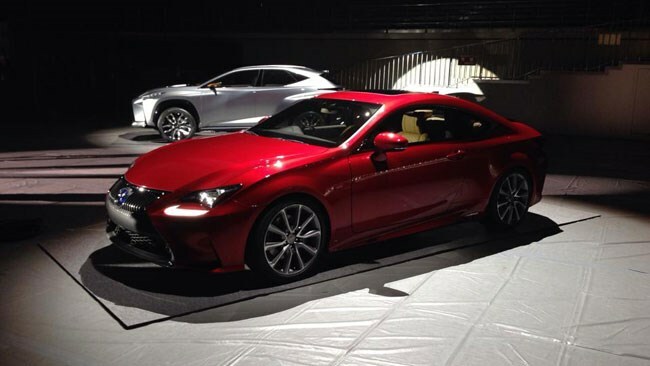 Lexus has given the world a sneak peek at the sporty new RC coupe it will unveil at the Tokyo Motor Show. The covers came off at a lavish preview event at a sumo wrestling stadium in suburban Tokyo and the styling was divisive. The RC features a new and unique interpretation of the spindle grille, which looks like it might feed on krill and spend a lot of time hiding from Japanese people with harpoons. The overall design is sleek and low, with plenty of design DNA from the IS range, but engineers were admitting that some of the sharper creases and feature lines might not actually make it to production. It was also speculated that a bigger bonnet bulge might emerge to contain a V8-powered F Sport version known as the RC F, which should break cover next year and will be aimed at BMW's new M4. Lexus was not revealing any engineering details about the car but it is widely accepted that it will be offered with both a 2.5-litre four-cylinder hybrid and a 3.5-litre V6. The concept is 4695mm long by 1840mm wide, 1395mm high and has a wheelbase of 2370mm. The aim of the RC is to attract younger customers to Lexus and it has been designed with the potential to lift its lid. A convertible is not a priority according to one Lexus spokesman, who said that the coupe was more important for getting the upwardly mobile young buyer, while a convertible would appeal to older buyers.